It’s a rare case, when creative ideas just pop up in your head. More often creativity is a process of running back over the existing ideas, mixing them up and shaping them into something original and fresh. When you are a blogger, you have no chance but to be creative if you want your posts to be interesting for people. However, to make a powerful tool of creativity work on you, you have to understand the process and learn to boost it when needed. Creativity is like a mysterious box – amazing things come out sometimes, but you have no idea what to put inside to make that happen. In this post we would like to explain some secrets of the creative process and tips on how to get the ball rolling. 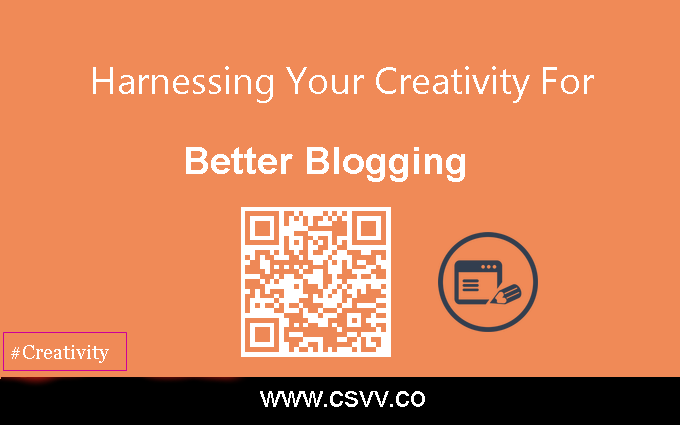 So, make yourself comfortable and read on for learning how to harness your creativity for better blogging. First thing you should do to boost your creativity is to find more time for your solitude. When you are immersed in the outside world with all those down-to-earth problems, routine and other boring things – you won’t have time to listen to your inner voice and consider the ideas that may appear. Yes, you are risking just to overlook or forget them. So, you need time for concentration and solitude. Let’s call it some kind of “creative meditation”. You don’t actually have to sit in the shadow in a lotus pose, but devoting time to your thoughts is just critical. You should be interested in what other people are doing, especially when you are a blogger, who should be in trend all the time. Of course, you should read other blogs and online resources, but don’t be limited to the same things. You will never get creative ideas if you are going to tick over all the time. For instance, if your sphere of interest is marketing – don’t get stuck with it. Use such websites as Student Share, etc. to read different study materials and familiarize yourself with sociology, psychology, communication, history, literature, etc. You will be surprised about the fact that combining your knowledge in different disciplines makes you think out of the box and come up with something really interesting and unexpected. So you are a blogger. You are passionate for writing and you must be passionate for reading. It means that you have favorite books, whether it is historical fantasy, realism, pots-modernism, or classic English literature. Can you apply this into your own ideas somehow? Take a moment to think about your preferences in literature, cinema or other hobbies and the ideas for your blog posts and ways to connect them. It’s not necessary to blog about your favorite book or something, but try using or imitating some writing techniques and style you see there. For instance, isn’t it a good idea to create a creative blog post about your experience in something using the style of noir novel? Anytime you have a good idea – write it down, throw it in a text file, or capture it anyhow. Even if you think: “Nah, I’m never going to use this” – just keep it in your Evernote. In a couple of days or weeks you will review it and something may spark for you. Moreover, there is nothing more bitter than forgetting a really good idea and then trying to recall it unsuccessfully. Sometimes it is enough to turn on your favorite music to make your mind start working productively and tune in to the right wave-length. Even if you are going to write a long and energy-consuming post, just listening to your favorite melodies can activate your brain and support you during your long way. Any type of music will do, but if music with lyrics distract you – try something instrumental – jazz, electronic or classical. People say, classical music is the best type of music for intellectual activity. Blogging is a creative work. However, you may have other creative activities in your life as well. If you like painting or taking photos – it’s just perfect. But listening to the music, cooking a meal or watching a movie also work. If you can brainstorm and write down your ideas during these activities – this double punch will stimulate your creative mind for sure. The last tip must be the most important and effective – just write. All the ideas listed above will support you, but only when you harness your willpower and sit down to write. Even if you don’t know how to start, write “I’m going to write about X, but I don’t know how to start. Actually, X is very important because…” And in a couple of minutes you will realize that you have already composed an introduction for your post! So, to start writing you just have to start writing, for better blogging. If you hear someone say that there are no new ideas – don’t believe them. The truth is that there are billions of them, especially when we are creative enough to use and remix old ideas in new ways. Veronica Hunt is an education technology expert and blogger. She loves yoga and traveling. Follow Veronica on Google+ and Linkedin.